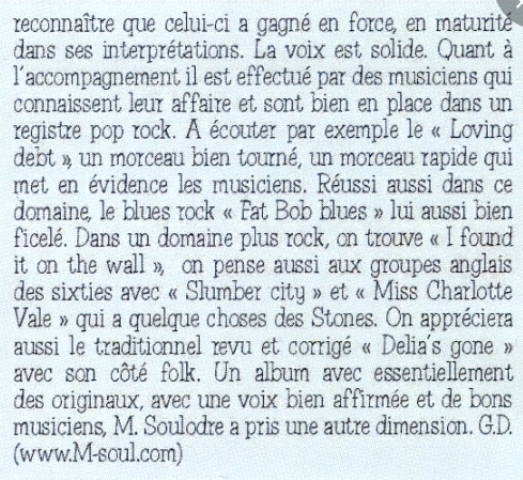 Dans l’univers anglophone des grandes plaines canadiennes, M.SOUL s’est démarqué par ses compositions en français. Aujourd’hui , résidant en France, c’est, paradoxalement … en anglais, qu’il choisit de célébrer les femmes, sur des rythmes nord-américains new vintage, passants du Blues au Rock’n Roll. Voici le nouvel du canadien M.Soul, This Time The Girl’s in Trouble. 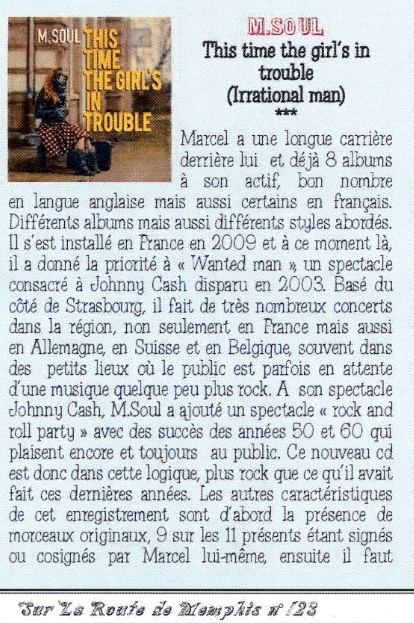 Singer Songwriter Marcel Soulodre has a clever way of shortening his name and fortunately for us, more than a few clever songs to listen to. He is from Winnipeg, lives in France, but practices more of an Americana, country infused brand of rock’n’roll. He writes stories in his songs, which keep attention to the lyrics, aided of course by expressive singing. The music is bright and vibrant and varied in style and pace. I like the rousing numbers like ‘Fat Bob Blues’, although all the songs are worth a listen. Hard to find any fault with the quality of this release. 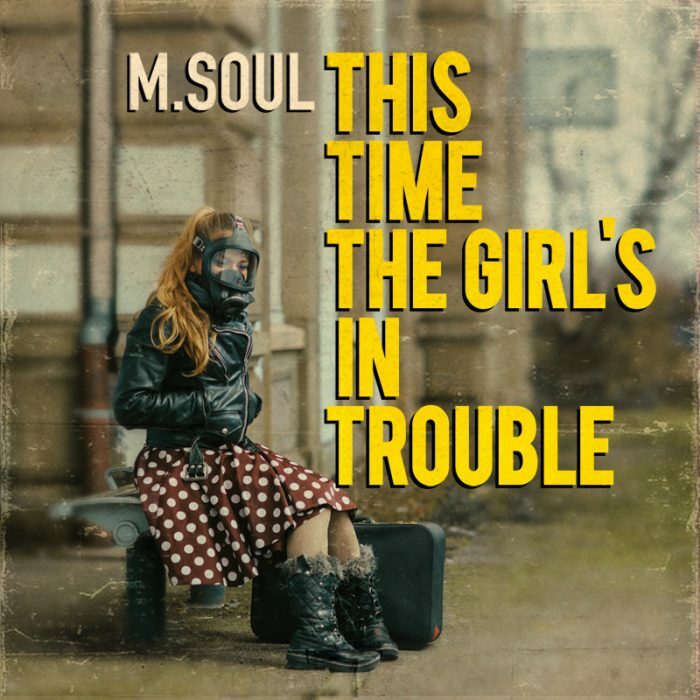 M.Soul is Marcel Soulodre, a St. Boniface musician who’s been living and performing in France for the past seven years. 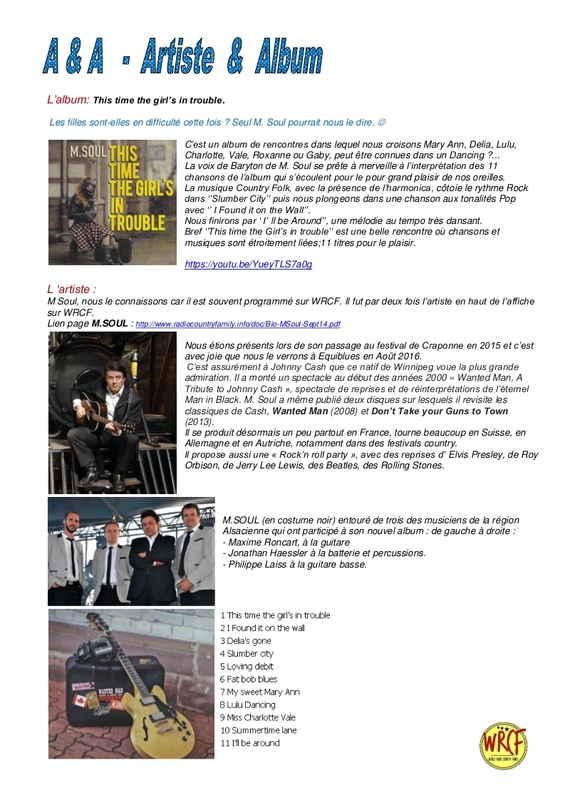 In France, Switzerland and Germany, he’s best-known as an interpreter of Johnny Cash material – his 2015 album of Cash covers, Dont’t Take Your Guns to Town, was named best album by the Franch Country Music Association while he was named best male performer. 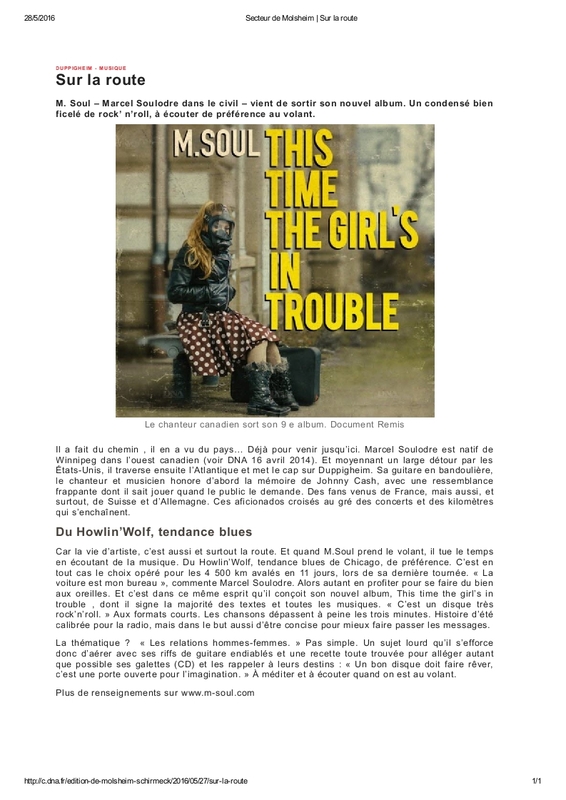 This time the girl’s in trouble is Soulodre’s return to original music, offering up 11 songs that reflect and affirm sensibilities he honed as a young man steeped in Winnipeg’s roots, blues and rock scenes of the 1980s. The standout track is a beautiful version of Delia’s Gone , a folk-blues traditional which Soulodre and band turn into a cut that could have been made by a mid ’70s Gordon Lightfoot. But Soulodre’s 10 compositions – especially the uptempo numbers – also stand on their own. The album-opening title tune features a breezy melody that belies the gritty scenes described in its lyric, and Fat Bob Blues, with its “I’m the king of the down and out” refrain could be an anthem for middle-aged Harley riders everywhere. Slumber City tells the tale of a bereft man at his wits’ end, while Lulu Dancing (co-written by former Free Press rock critic Frain Cory) is a wistful reminiscence of youth that even namechecks local rock act the Fuse.